One of the best providers in Thunder Bay, Ontario is Thunder Bay First Aid. First aid, cardiopulmonary resuscitation (CPR), and automated external defibrillation (AED) are programs that are offered by this provider. Because it is affiliated wit St Mark James, students receive high quality training from St Mark James certified instructors. All classes are offered at very flexible schedules as well, so you can expect classes to be available during evenings and weekends. Even private instructors are available for booking! Just visit the Thunder Bay First Aid website for more details on rates and schedules. Enrolment is very quick and easy. Students can easily sign up for any program through telephone call or e-mail. Any requests made will only be entertained during business hours. Walk-ins are also highly encouraged by the Thunder Bay staff. The easiest way to sign up is through the registration form on the Thunder Bay First Aid website. Thunder Bay First Aid is dedicated to providing convenient ways to register for any class you want. Because all fees are settled before training starts, students don’t have to worry about incurring additional expenses while they train. Full fees include tuition, taxes, certificates, and St Mark James training manuals. Thunder Bay First Aid also registers your certificate with St Mark James after you’ve passing your enrolled training program. If you decide to drop out, just notify the staff at least 72 hours beforehand so you can receive a full refund. The full first aid program is 14-16 hours long, inclusive of cardiopulmonary resuscitation (CPR) and automated external defibrillation (AED). AEDs are machines that can give the heart electrical shock when performing CPR. The first aid curriculum also includes popular topics such as wound care, bandaging, variations of the Heimlich maneuver, and many more. Skill development is one of the core values that the Thunder Bay First Aid curriculum places great emphasis on. CPR-only classes are also available at Thunder Bay First Aid. There are three training levels: A, C, and HCP. All three teach basic CPR and AED for adult victims and C and HCP also include basic CPR and AED for pediatric victims. HCP is targeted towards health care providers working in a health care facility or setting. Students can also book private trainers for special training in the comfort of their own home. Instructors can also be hired for special events (typically done by companies and schools) like seminars and conferences. Be sure to send an e-mail or give call to inquire about instructor rates and schedules. To pass a program, students need to attend all classes, get at least 75 percent on the written exam, and perform all taught first aid skills well. After passing, certificate cards are awarded to all students. Certificates have to be renewed within every three years in a recertification program. 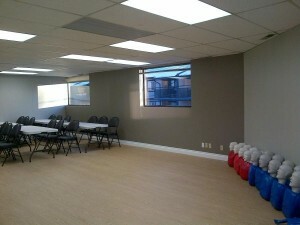 Standard first aid recertification is held twice a week, 8 hours long and inclusive of CPR C or HCP renewal. We respect your privacy and are committed to keeping your information private. We adhere to strict privacy policies and will not release your information to any third parties. Your information will be sent to Thunder Bay First Aid. They will contact you within 1 business hour.